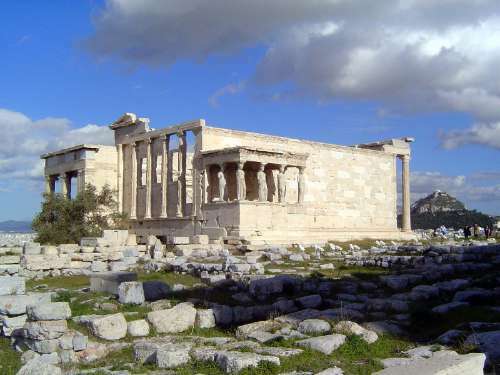 The Erechtheion was built between 421 and 407, possibly as a replacement for the Temple of Athena Polias, which stood in the foreground. A picture drawn in 1805 by Edward Dodwell shows the Acropolis at that time as a military encampment. Dodwell wrote, "Large masses of Pentelic marble were broken into smaller pieces for the construction of the miserable cottages of the garrison.... Such is the pleasure with which uncivilised ignorance or frantic superstition, destroyed in a moment the works of years, and the admiration of ages." (Quoted by Beard, p. 80) The Panathenaic Procession terminated at the Temple of Athena Polias or, later, at the Erechtheion, because these were the buildings--not the Parthenon--that held the sacred olive-wood statue of Athena, redressed annually.